TICKETS NOW ON SALE - and selling FAST!! See you & your friends there! This event is an absolutely amazing day with friends at the ballpark like you have never seen before! Be sure to "Like" & "Share" above to help spread the word!! Ticket Prices Will Increase - BUY NOW for the Best Price! Includes access to hundreds of craft beers, wines and spirits for session 1 (12:30-4:30pm), a commemorative sampling glass, ability to walk the warning track + visit the dugouts (weather dependent), 2 Pirate's tickets, great entertainment, vendors, games, giveaways, and more. Includes everything listed with General Admission tickets for session 1 (12:30-4:30pm), just at a discounted group rate. Must purchase 8 or more tickets to qualify. Includes everything listed with General Admission tickets PLUS access to session 1/2 hour early entry from 12-4:30pm, a private VIP area with exclusive beers & wines, private VIP line for entry, air conditioning, private restrooms, and more. Includes everything listed with VIP tickets for session 1 (12-4:30pm) PLUS an incredible rooftop area with lounge seating, meet & greet with Pirates alumni (times TBD) PLUS a sampling card good for 10 sample pours of exclusive, premium craft beers, wines, and liquors (this is the GOOD stuff! ), PLUS a custom event t-shirt (you choose your size) PLUS fast-pass "skip the line" entry into the event! You will have access to all areas of the festival as well. Includes everything listed with General Admission tickets for session 2 (7-11pm), just at a discounted group rate. Must purchase 8 or more tickets to qualify. Includes everything listed with General Admission tickets PLUS access to session a 1/2 hour early from 6:30-11pm, a private VIP area with exclusive beers & wines, private VIP line for entry, air conditioning, private restrooms, and more. Includes everything listed with VIP tickets for session 2 (6:30-11pm) PLUS an incredible rooftop area with lounge seating, meet & greet with Pirates alumni (times TBD) PLUS a sampling card good for 10 sample pours of exclusive, premium craft beers, wines, and liquors (this is the GOOD stuff! ), PLUS a custom event t-shirt (you choose your size) PLUS fast-pass "skip the line" entry into the event! You will have access to all areas of the festival as well. Ticket Sales End at: 6/29/2019 7:00 PM (or if sold out) $79.95 01234567891011121314151617181920212223242526272829303132333435363738394041424344454647484950 1! NEW THIS YEAR Choose from two different sessions for the ultimate sampling experience! Tickets will be extremely limited for each session. You will have the choice of a day session (12:30pm to 4:30pm; 12:00pm for VIPs) or a fantastic night session (7:00pm - 11:00pm; 6:30pm for VIPs) where you can sample & be on the field for an unforgetable night under the lights! Looking to organize a large group? Contact Us for special rates. Click Here for Pittsburgh Parking Deals! Includes unlimited samples of 250+ craft beers, wines and cocktails during either session, a commemorative sampling glass & map, ability to walk the bases & warning track + dugout photo opp, 2 tickets to a Pirates game during the 2019 season, great entertainment, vendors, games, giveaways, and more. Includes everything listed with General Admission tickets PLUS 1/2 hour early access to the event, private VIP gate for entry, multiple private VIP areas (Gunner's Lounge, Keystone Corner, Club 3000, Jim Beam Left Field Lounge) with exclusive beers & wines, air conditioning, private restrooms, and more. 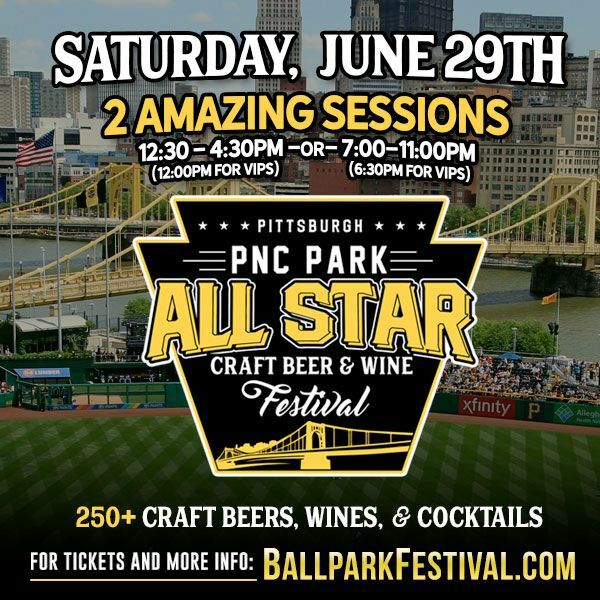 Includes everything listed with VIP Admission tickets PLUS an incredible rooftop area with lounge seating, meet & greet with Pirates alumni & other local celebrities (times TBD), a sampling card good for 10 sample pours of exclusive, premium craft beers, wines, and liquors (this is the GOOD stuff! ), AND a custom event t-shirt (you choose your size!) for you and your friends. You will have access to all areas of the festival. Includes access to the event and 2 Pirates game tickets. No alcohol samples are included and does not include a sampling glass. Must be 21+ for Designated Driver. DD ticket holders can enter the VIP area as long as they are with a VIP ticket holder.